The product is made from CHITIN Chitin (pronounced kite-in) came into being in the 1970’s when the EPA ordered fishing companies to stop dumping the shells of crabs and lobsters back into the ocean. Researchers discovered that the chitin contained in the shells had properties that could be applicable in a variety of industrial uses. Similar to cellulose, chitin is a naturally occurring polymer. designed for COMMERCIAL POOL use. The properties of chitin enable it to attach itself to a variety of organic contaminants, minerals, metals and oils. The result is clearer, cleaner water with less staining and scaling. It also has a beneficial effect on the filtering medium, whether sand, DE or cartridge. Chitin’s natural coagulants help the filter to trap more dirt and debris. It is a great addition to any sanitising program. 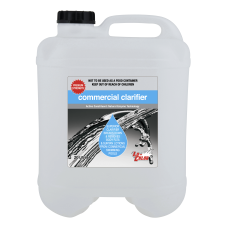 LO-CHLOR PREMIUM STRENGTH COMMERCIAL CLARIFIER is added as a liquid directly to the pool. In a commercial environment, it can be described as an all in one replacement for clarifiers, filter aids, stain & scale magnets, and enzymes.